This is a common question for authors. There are many permutations in the answers, but the most common theme is: From real life. Even for science fiction and fantasy, it all starts from a seed on Earth. Agents of Rivelt, for instance, sprouted from a sentence murmured by my husband, Phil. After we shared a good laugh, his story scrap took root in my brain. What situation could prompt that statement? From this seed grew the story Never Blackmail a Thought-Reader, where Tracy gets to utter that key bit of dialog. I only envisioned this as a stand-alone, just-for-fun, short story. The thing is, every science fiction story needs a universe in which to live. Where one seed sprouts, more can grow. Now it’s like the apple tree in my backyard, sending shoots up through the soil. But in this case, each shoot is another space station where a new story unfolds. Readers sometimes ask me where the series is going. How many stories? Will it become a novel? I currently envision around a dozen stories. I won’t rewrite it into a novel, but all the stories together will have a complete story arc. My goal is to make each one satisfying on its own, as well as giving the series a solid conclusion. Here’s the short-term schedule. The fourth story, Trapped Rescuer, releases January 12. The fifth, Assassin Hunting, is available for pre-order and releases March 1, 2018. The sixth? I’m in the middle of the first draft and still pondering the title. It should be released in mid-April. Here’s the scoop on the current release. No way out. Now what? Vigard and Tracy check the off-limits interior of a space station for a slave in hiding. Tracy is spotted by a Syndicate watcher and must somehow become invisible. Vigard is trapped in the space station’s core with no way to break through the rank of searchers closing in on him. What happens when the rescuer becomes more trapped than the slave he is freeing? 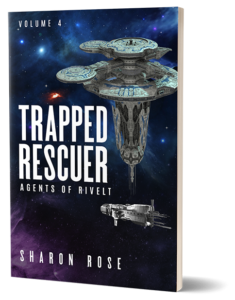 Trapped Rescuer is the fourth short story in the science fiction series Agents of Rivelt by Sharon Rose. If you are intrigued by telepathy, danger, ingenuity and action, this story is for you. If you have any questions about my stories or the writing life, just enter a comment on this post. Hope your new year brings you exciting adventures in between many peaceful moments.